Oh my sweet day....how are you all doing? I am way shocked that it was been 2 months since I posted. But you can't say I didn't warn you! I wanted to soak up my littles this summer and I did! Still am, in fact. We don't start school until September 4th! A Chalkboard & Clipboard Photo Sign. ...On the other is a clipboard for a first day interview. I know a prettified clipboard is nothing new but I thought this was a fun twist. Paint the back of your clipboard with chalkboard paint and let it completely dry. Trace your clipboard shape on a piece of card stock and cut out. Cut out a notch so the paper will go around the clip part of your clipboard. Now you can glue the card stock/paper to the front of your clipboard with spray adhesive and let dry. The clipboard I bought at the dollar store were exactly 12 inches in length...perfect for the rulers I purchased. So be sure to measure your clipboard first. Some are longer. I chose the dollar store clipboards because they did not have such a large clip so it will be hidden when using the chalkboard side for photos. I used 2 full length rulers and then cut the other two for the short sides. I used hubby's hack saw to cut these. I just measured the length I needed and sawed away. I won't give you measurements since they may be different for you depending upon your clipboard and rulers. File down any rough edges and glue onto the sides of the chalkboard. Now you have a cute chalkboard frame on one side and a handy clipboard on the back for your first day of school interview. I also thought it would be fun to do this on the LAST day of school to to see how my girl's change physically and to see what their answers are at the end of the year as the prepare for SUMMER again. Hope you enjoy and I am so excited to reconnect with so many of you! I have missed you so! P.S. 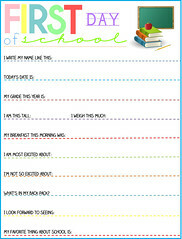 Amy at Positively Splendid has some adorable First Day of School printables as well. 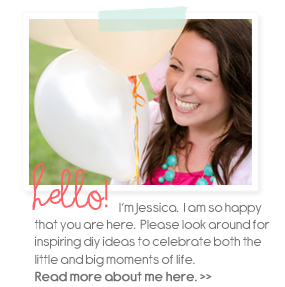 Go check them out on her beyond fabulous blog! What a great craft!!! I love the idea of the interview, too. And I'll be praying for you as you transition to both in school. I'm doing the same thing this year. I'd be sad except for the fact that Miss M's so darn excited about the whole thing. She wants to ride the school bus, and today as we passed some apartments near her preschool, she informed us that was where she'd be living. "Uh... you don't have to move out and find your own transportation at 2 yrs old, kiddo." So, I guess she's ready. Now are we mommas ready? 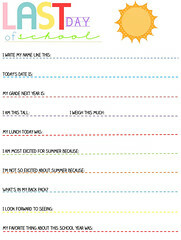 Can't wait to see your ideas back in blog land and give you props for taking a much needed summer break. Love you! Cute crafts! I'm glad you have had such a wonderful summer with the kiddos. Good to have you back blogging soon. I've missed your beautiful posts. You're the bomb, girl! I never use that phrase, but it just felt right. :) Love it!!! This is adorable! Since I'm a teacher, I would use this as fun decoration for my classroom. I wish it wasn't so hard to find plain wooden rulers in Canada! Visiting from your shout out on The Cottage Market! I love, love, love, comments and I read every one! Please keep in mind that I sometimes moderate each one so it may take a bit before it appears on the post. Thanks my sweet friends!